What is wonderful about the holidays are family traditions. Every year, I make lasagne for Christmas Eve dinner. This year, I decided to use mild spicy Italian chicken sausage from Whole Foods. It’s not organic, but it contains no antibiotics or hormones. The chicken sausage was delicious with just the right amount of spices! 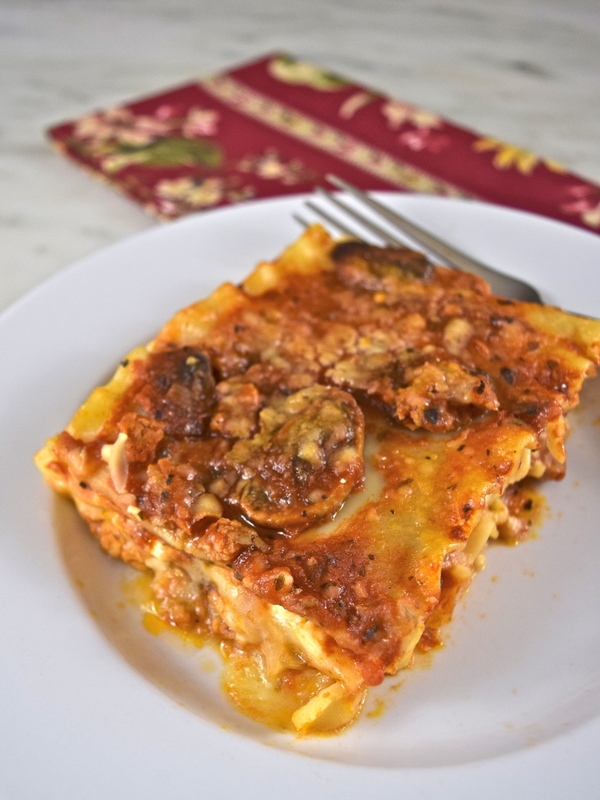 What is great about this dish is that the sauce can be made in advance, so all you have to do is cook the lasagne noodles and assemble. It makes for fabulous leftovers and came in handy for the day after Christmas, when my daughter and I were crazy enough to go shopping! In a large nonstick frying pan, brown the chicken sausage until it is no longer pink, breaking it up into small pieces. (Depending upon the sausage I use, sometimes chicken or turkey sausage, I may have to drain the fat from the meat. This time I did not have to drain). Using a 3 quart pan, warm olive oil over medium heat. Add onion, garlic and mushrooms and sauté for about 5 minutes. Stir in tomatoes, sausage, oregano, basil and parsley. Cover and simmer for at least one hour, stirring occasionally. Add pepper to taste. Preheat oven to 350 degrees. 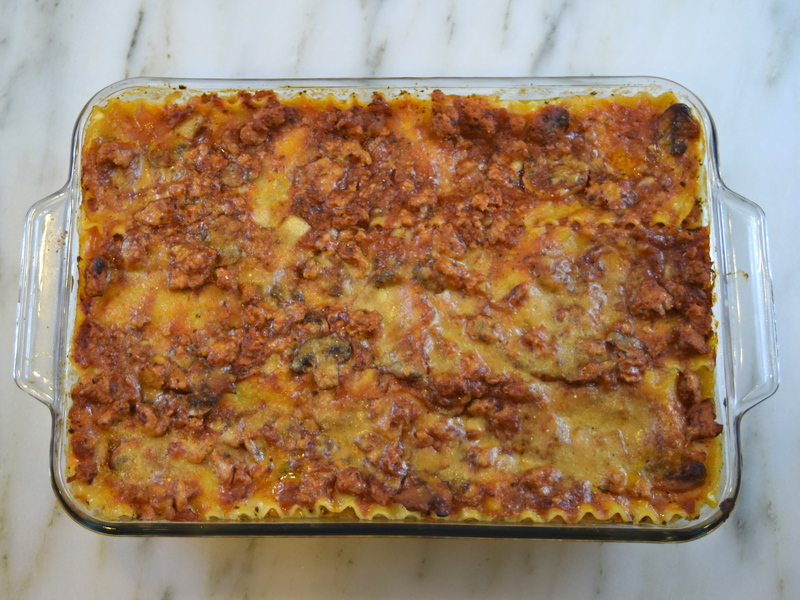 Lightly grease a 9¼” x 13¼” lasagne baking dish with vegetable oil. Spread a little sauce over the bottom of the dish. Cover with 3 lasagne noodles, spread half the mozzarella and cottage cheeses and sprinkle with one-third of Parmesan cheese. Then add one-third of sauce, just enough to cover. Repeat with noodles and cheeses. Finally, add the third layer of noodles, followed by remaining sauce and Parmesan cheese. Bake covered with aluminum foil for 30 minutes. Then uncover and bake for another 15 minutes. Take out of oven and let it sit, covered with foil for 10 minutes. Serve hot. Serves 12. Lovely version of this classic dish. And I bet it tastes just as good a couple of days later. Thank you for your kind comment. You are correct…it does taste even better a couple of days later!